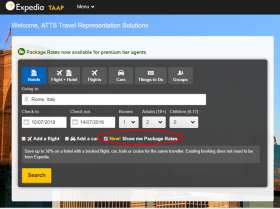 Package Rates is Expedia TAAP’s new feature for Silver, Gold and Platinum agents. The Package Rates are special hotel rates for these premium affiliates. It can save up to 30% on hotel rates. To validate the Package Rates, the affiliates must have the proof of an associated booking for the same traveller. The associated booking could be flights, car hire, train or cruise. Another advantage of Package Rates is the associated booking doesn’t need to be from Expedia which provides more flexibility and freedom to your clients.